It is a challenging task to build a large-scale web application, there are fundamental characteristics to take into account: for example, efficiency, safety and robustness. Finagle is a asynchronous, Netty based JVM RPC system made by Twitter which makes it easy to build high available clients and servers in Java and Scala. And it can even simplify your application architecture. Here I want to show you how powerful Finagle is. Let's first have a quick look about how to create a Finagle micro web service and a Finagle http client to consume this api. Create a sbt project and import dependencies. "org.scalatest" %% "scalatest" % "2.2.4" % "test"
First, let's define a service. Here we define a service to receive a http request and get its url parameter as Integer then return a http response by plus 10. Last let's define a client to consume this server. If you run the two application you will see the server running on localhost:9090 and client get response 15. Simple right? As you can see our service and client are both type of Service[http.Request, http.Response] . This data type really confuse me in the beginning. I will explan what's the differences between them. A service is a function that takes request of type Req, and return a response of Future of Rep. This Services type are used to represent both clients and servers. To answer my previous question, the differences between service and client is that a Finagle client “imports” a Service from the network. However, a Finagle server “exports” a Service to the network. Note: the Future here is twitter future not scala future. There is no differences on conception. Some times we want to add application-agnostic behaviour, we can use Filter to achieve this. If it is not clear please check image below. A filter can attached to client and server side. Let's try to implement a simple timeout filter. A filter can be applied on server side too. Here is an example. First let's define a filter. This is the part that I like the most in finagle. Finagle http client is designed to maximize success and minimize latency. Each request will flow through various modules. These modules are logically separated into three stacks: Client stack, Endpoint stack, connection stack. manages name resolution and balances requests across multiple endpoints. provides circuit breakers and connection pooling. provides connection life-cycle management and implements the wire protocol. To use finagle http client is very simple. Define a client first and define a http request, then apply request on the client. What I want to emphasis here is the Load Balancer module. This module brings a lot of benefit for your application. It can simplify your application infstracture. Let's compare it with traditional solution. 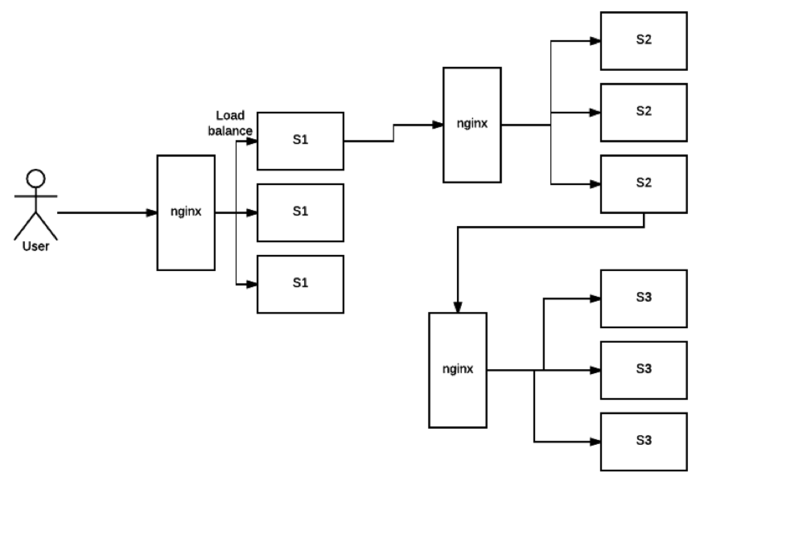 As you can see, the traditional solution highly rely on nginx as load balancer, once nginx dead your service is not reachable, in real production environment, you have master-slave nginx wiht keeplived installed on nginx machine for heartbeat detection. This looks really complex, what about if we can get rid of these nginx? Let's have look at following code. This means you supply three addresses and put it into finagle http client. 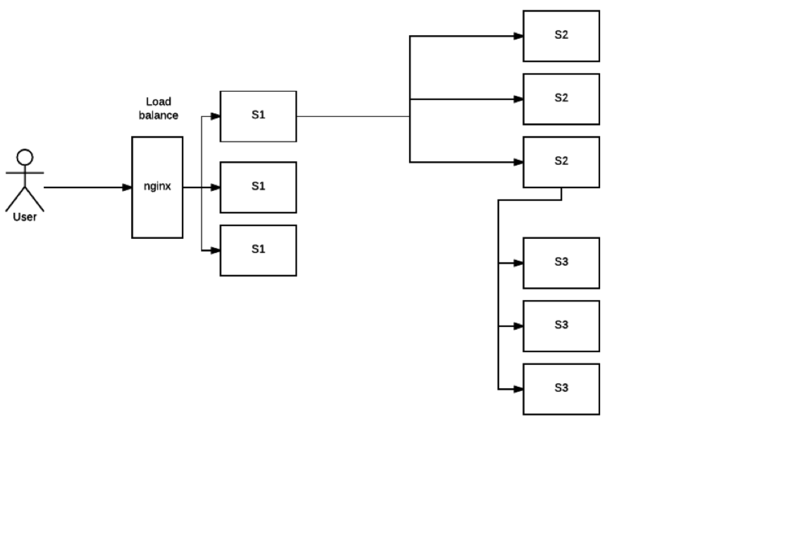 Finagle client will dispatch the request to one of address based on certain load balance algorithmn. The default algorithmn is "Exponentially Weighted Moving Average (EWMA)". Pretty simple right. Your apis talk to each other directly. Finagle is a protocol-agnostic RPC system. It means Finagle supports every protocol if people implement it. For example: finagle-thrift is using thrift protocol. finagle-mysql implements the mysql protocol. We want to make a api count service to count how many times the web service has been called. In section Service and Filter. We send http request and put number as query parameter. It just feel strange that I just want to send a number to count server, to achieve that I have to send a http request. Because I don't use any data from header, cookie and body. If the application is running on AWS, it those junk information cost money. So it's ideal to just send a integer number to api count service. Let's implement this by customize finagle protocol. * Converts an scodec codec into a Netty encoder. * Converts an scodec codec into a Netty decoder. * Creates a Netty channel pipeline factory given input and output types. * Creates a Finagle codec factory given input and output types. * for both the input and output types. * Creates a Finagle client given input and output types with scodec codecs. Finagle is a very flexible asychronous, protocol-agnostic RPC framework. It can help you to build high performance micro service with any protocol. It is worth to take a look at Finch the web framework based on Finagle. You can find more detail introduction from Twitter blog and more detailed example from Twitter scala school.